This 1957 Mercedes 300 SL Roadster was sold for $737,000 at RM Auctions’ Scottsdale sale in January of 2012, it’s being offered again at the RM Sotheby’s sale in Scottsdale this year, pre-sale estimate is $950,000 – $1,050,00. What makes this car interesting to me is that it was restored by my friend Bruce Kelly at Lake Country Classics in Minneapolis, MN. Bruce has been a part of the Minneapolis classic car community forever. Mercedes-Benz enthusiasts have been relying on Bruce, and his shop “Lake Country Classics,” to take care of their cars for 25+ years. In addition to regular mechanical work, Lake Country Classics has restored many Mercedes W113 ‘Pagodas’ and a number of 300 SLs. The car being offered at RM Sotheby’s sale in Scottsdale in a couple weeks is one of them. I reported on this car here on Dave Knows Cars back in 2012 when it was sold by RM auctions the first time. I wrote that brief article, live, as the car was crossing the block in Scottsdale. It hammered sold at $670,00, add the 10% buyer’s fee and the new owner paid $737,000. Back in 2012 that was a market correct number for a nicely restored 300 SL roadster, as the roadsters regularly lagged behind Gullwing prices back then. Since 2012, 300 SL roadster and coupe prices have, more or less, equalized… condition, color combination,,provenance, quality of restoration, etc. are more important factors when it comes to the money today. Odometer reading from RM Auctions 2012 catalog. When this 300 SL roadster was sold in 2012 it was reported to have participated in the Copperstate 1000 Rally in the early 2000s and again in 2008, after it was restored at Lake Country Classics in Minneapolis. The auction catalog for the 2018 sale reiterates participation in those events, but it doesn’t seem like much has been done with the car since it last changed hands. The odometer read 43,702 when it was sold in 2012. 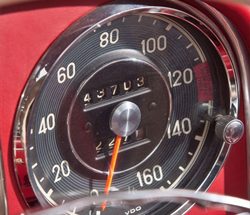 The auction catalog for the 2018 RM Sotheby’s Scottsdale sale states the current mileage is 44,145. Just 443 miles in 6 years. It’s a shame the owner didn’t drive the car more. 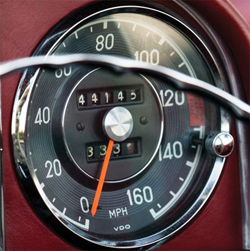 The odometer reading from the 2018 RM Sotheby’s catalog. The auction estimate of about a million dollars seems realistic to me. This car, in a great color combination, although, I’m not sure that it’s the correct combo for this car, one would need to refer to the car’s build card to confirm, is a desirable touring car, eligible for many events. The wheels are described by RM Sotheby’s as ‘N.O.S. Rudge-type knock off wheels’ which leads me to believe this car was not equipped with Rudge wheels when new. It is equipped with a set of Baisch luggage, books, manuals and a tool kit. Long referred to as the ‘Gold Standard’ of collector cars, 300 SL sales have often been referred to as a bell weather of the market. Since the ‘high tide’ of the 300 SL market during 2014 and 205, things have settled down a bit. 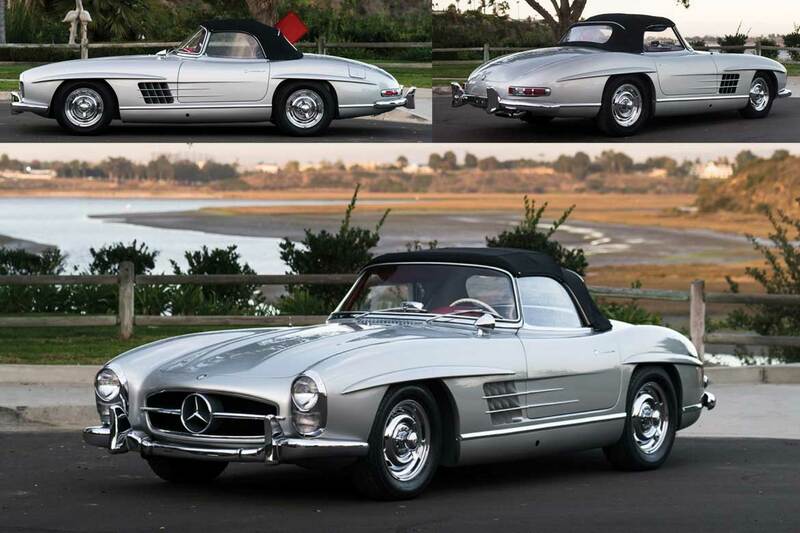 Gooding and Company sold a nice 1961 300 SL roadster in January of 2017 for just over $1 million dollars. It was an older restoration and well sorted, I thought it seemed like a bargain, but it’s becoming the new normal, as RM Sotheby’s pre-sale estimate shows. My prediction for this car when it crosses the RM block again in a couple of weeks? It will sell for just over a million dollars, as per the RM Sotheby’s estimate.